Probably 99% of pumpkin bread recipes are the quick bread sort, that rely on baking powder or baking soda for their rising. I do love a good pumpkin quick bread, but sometimes it’s kind of fun to make a pumpkin yeast bread. Pumpkin is wet and heavy and inhibits rising, so this recipe doesn’t use as much pumpkin per loaf as quick bread recipes do. The same goes for butter/oil…since fat gets in the way of yeast growth, pumpkin yeast bread requires far less butter or oil. This bread is also not as sweet as pumpkin quick bread. Because of this, I like to put a cinnamon swirl in my loaves, though of course you can bake it without the swirl if you prefer. Here’s how to make the cinnamon swirl version. Incidentally, I was out of raisins when I made this loaf, which is why they are not in the pictures. 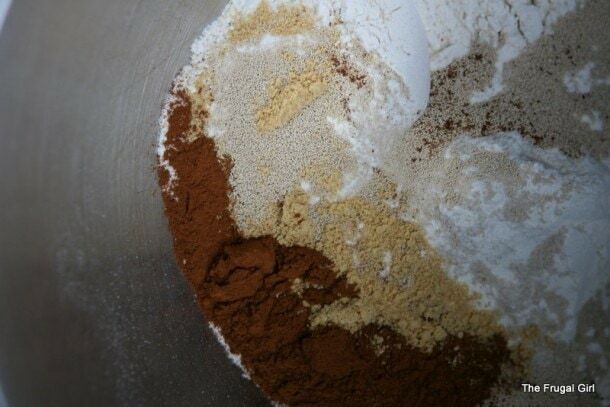 Combine the flour and the spices in a mixer bowl. 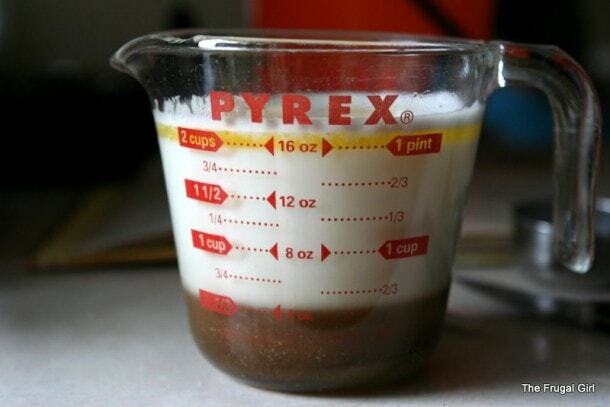 Heat the milk, brown sugar, and butter together. Add the liquids to the dry ingredients, and mix until combined. Add the pumpkin. Which will give you a funny looking orange-ish bread dough. Beat for 3 minutes, then add raisins (if you have them!) and enough flour to make soft dough. 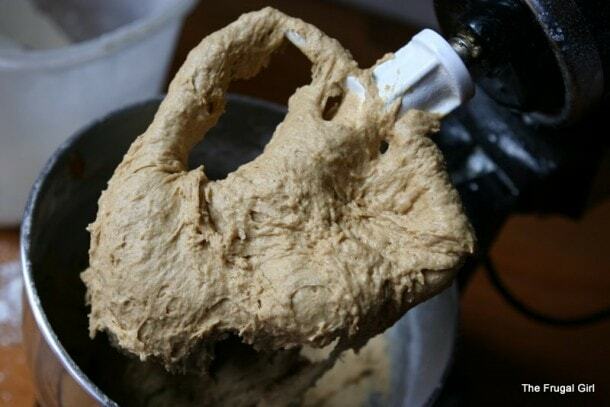 Turn out onto a floured surface and knead for 3-5 minutes, or until smooth and elastic. Cover and let rise for one hour. Punch dough down, divide in half, and roll each half out into a rectangle. Brush each rectangle with water, and sprinkle with cinnamon and sugar. Roll up jelly roll style, starting from the short end. Place in a loaf pan, cover, and let rise one hour. Bake at 350 for 30-35 minutes. Since this bread is fairly dense and heavy, err on the long side of baking. My children think this is delicious toasted and buttered for breakfast. Of course, most things that are toasted and buttered are pretty delicious. 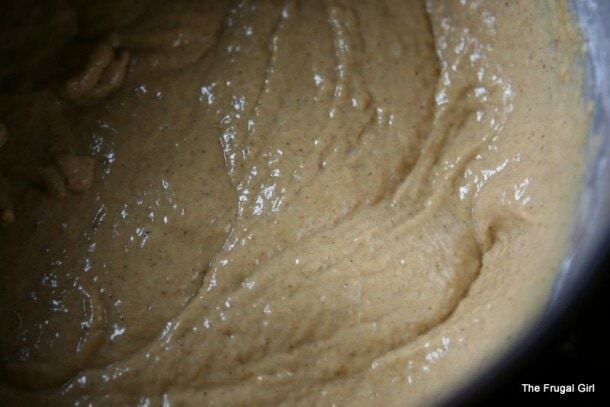 In large mixer bowl, combine 1 1/2 cups flour, the yeast, and the spices. Heat milk, brown sugar, butter, and salt to 115-120 degrees. Add to dry mixture in mixer bowl; mix until combined. Mix in pumpkin, and beat for 3 minutes on medium speed. 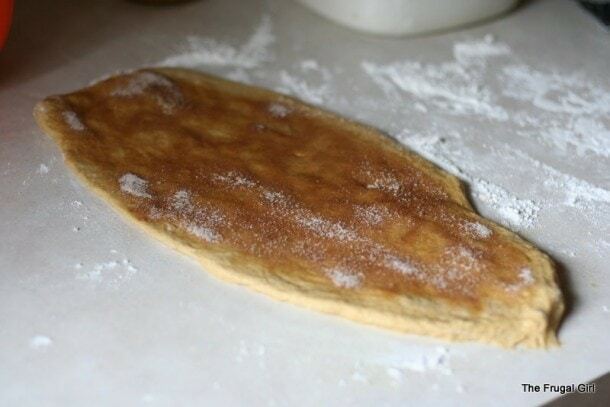 Add raisins, if using, and enough flour to make a soft dough. Turn out onto a floured surface and knead for 3-5 minutes, adding more flour as necessary. Place in bowl, cover, and let rise for 1 hour. (3 tablespoons sugar and 1 teaspoon cinnamon). Starting from short end, roll up jelly-roll style and place in a greased 8×4 inch loaf pan. Cover; let rise until double (about 35-45 minutes). Bake at 350 for 35-40 minutes. Remove from pan; cool. This sounds fantastic! 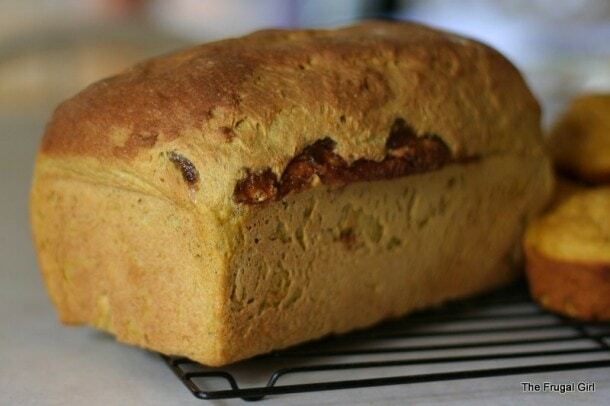 It combines two of my favorite breads – pumpkin and cinnamon raisin. Do you know if you can make this without a mixer? Unfortunately I don’t have a mixer and I avoid quite a few recipes because I’m afraid they will turn out wrong. Is the mixer necessary for some recipes? Erika, you can most certainly make it without a mixer. You’ll just need to mix it well by hand and then knead it longer…more like 10 minutes or so. This bread is slightly trickier to make by hand than say, a sandwich bread, so if you’ve never tried baking bread before without a mixer, I’d suggest starting with a plain white bread. If that works out fine, then you could branch out and try some whole grain breads or this bread. This looks yummy! 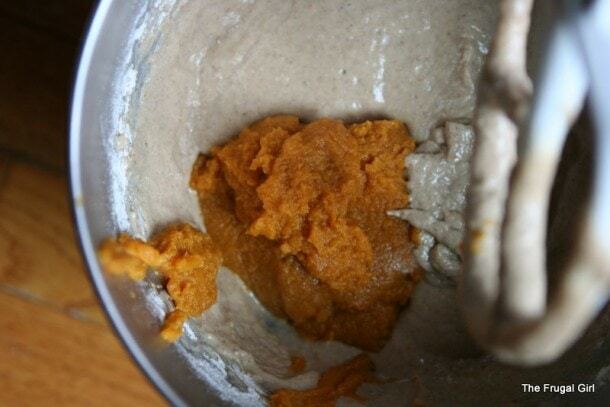 Question: what do you do with the rest of the pumpkin puree (assuming you use canned)? I saw a recipe like this in Taste of Home magazine. Now I really want to try making it after reading this post. Thanks. This looks fabulous! I think I may try it this weekend, it would be the perfect kick off for a morning at the Christmas tree farm! This looks great! I have a question about breads with cinnamon swirls. In your picture with the sliced/buttered piece, do you see the way there is a small gap where the swirl is? The gap in your slice is nice and small, but every time I have tried to make a cinnamon swirl, the gap at the top of my bread is huge. It’s like a 1/2″ to 1″ opening that basically makes the top crust fall off when you slice a piece. I’ve tried rolling it really tightly and making sure my seam is at the bottom of the loaf. Do you have any pointers for me? Alice, I used to have that problem too. Do you brush your bread with butter before you sprinkle it with the cinnamon sugar? If you do, that will cause a gap. Using water makes it much more likely that the bread will stick together as it rises. Gaps can also be caused by overloading the dough with the cinnamon sugar. If you put a ton into the bread, it is sometimes too heavy for the yeast to lift, and so the lighter top crust rises above the swirl part, if that makes sense. So, use water and don’t put too much sugar on, and I bet your loaf will be less gap-py! Cate, I use the pumpkin in muffins, usually. I made this right after I read your email. What a fantastic loaf of bread. My kids thought it was pretty great too. It makes a huge loaf of bread but that just means more to eat. Thanks for the recipe!! Goodness, Laura! You should get a prize for prompt baking or something! lol I’m so glad yours turned out well. Bread in the oven! Made “pumpkin cups” with the remaining canned pumpkin. House smells fabulous. just pulled my loaf out and had a tasty slice-can’t wait to have more for breakfast!!! thanks for posting! it was fun to try a yeast bread instead of the normal quick breads. Yum! I made this last night and it was delicious! I think next time I’ll up the cinnamon in the cinnamon sugar mixture to 2 tsp instead of 1 tsp. I used the extra canned pumpkin to make a pumpkin apple quick bread, but after eating some of this, I wished I’d just doubled (or tripled!) this recipe. Just finished mixing up this bread and am now waiting for it to raise. I can’t wait till I can taste it. I have been devouring your site the last 2 days, after seeing the piece on 700 club. I have always been frugal and am always looking for ways to save. I am a on again off again baker. Your recipes have inspired me to have a baking day today! So far it has been your sandwich bread and Cinnamon Rasin Swirl bread. Next will be the zucchini bread. After I go grocery shopping granola and granola bars will be next! Tip for those without a mixer…I don’t have a mixer either and use a very large wide topped bowl to mix my breads in. 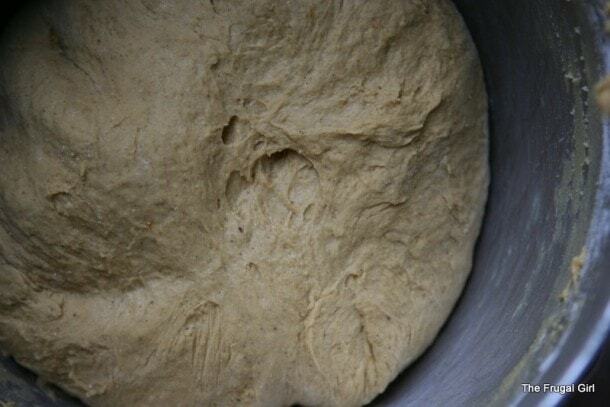 When the dough gets too stiff to mix with the spoon I begin kneading the flour into the dough right in the bowl. No extra mess on the counter! I just keep kneading till I have a nice smooth elastic dough. Thanks again for such a great blog! I love you blog I just made the pumpkin cinnamon bread and I have a question. The recipe indicates 31/2 cups flour but 1 1/2 cups is indicated later in the recipe (by your gorgeous photos) I used 3 1/2 and it seems to work–both loaves are rising now–just wondering which is correct. Hello, I’ve made your whole wheat and flour sandwich bread and they turned out great! I tried to make this bread without the pumpkin (just regular cinnamon raisin bread) and it did not turn out. It didn’t rise, it was hard to mix the raisins in, it was just an overall mess. 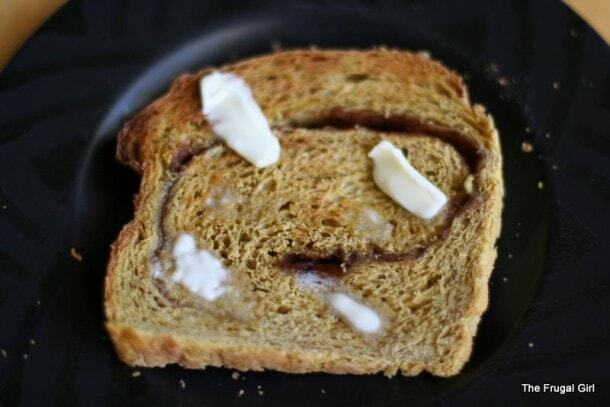 Should I have done something different (or added sonething) to make this simply cinnamon raisin bread? Thanks!